Toyota assembled the very first Corollaat the factory in Blue Springs, Mississippi on November 17, 2011 and celebrated the 500,000-car milestone on February 12, 2015. Fast forward to December 12, 2017, the one millionth sedan rolled off the line and now the company is gearing up for the next generation of the world’s best-selling car. 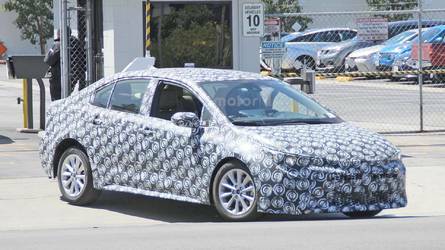 Likely scheduled to go on sale in 2019 for the 2020 model year, the all-new Corolla hasn’t been revealed yet. Like the hatchback introduced earlier this year, the popular sedan will switch to the TNGA platform, prompting Toyota to entirely replace the current production lines. $170 million are being invested in the plant and 400 new jobs are going to be created over the next 12 months. Toyota’s decision to invest money into its Mississippi factory is part of a larger investment of $10 billion in U.S. factories over the next five years. More than $1 billion have been spent in the Blue Springs factory since 2007, a factory that was originally supposed to assemble the Highlander SUV before a decision was made to switch to the Corolla. A total of 1,500 workers are putting together the current-generation Corolla and annual capacity stands at 170,000 units. With more jobs on the way and a revamp of the assembly lines, these numbers are all set to grow in anticipation of the twelfth-generation sedan. It’s worth mentioning the all-new Corolla will be manufactured not only at the factory in Mississippi, but also at anew assembly plant Toyota is building in association with Mazda in Alabama. It’s set to be operational beginning 2021 following a $1.6-billion investment and will have an annual capacity of 300,000 cars. Up to 4,000 jobs will be created at the plant where Mazda will put together a new crossover to cater the North American market. BLUE SPRINGS, Miss. (April 26, 2018) – It is springtime in Blue Springs, and plants – such as Toyota Motor Manufacturing, Mississippi – are growing. During a groundbreaking ceremony for Toyota Mississippi’s new visitor and training center, the company announced it would invest $170 million to build the 12th generation Corolla using Toyota New Global Architecture (TNGA). The TNGA investment enables the assembly plant to stay competitive globally. Implementation of TNGA, along with an overall increase in production, will create 400 new jobs over the next 12 months.This investment directly supports Toyota’s plan to invest $10 billion in its U.S. facilities over the next five years. This investment brings the company to $4.27 billion of new investment in the U.S. since the commitment was announced in 2017. Toyota’s total investment in the U.S. over the past 60 years is $25 billion. The $170 million investment in the Mississippi assembly plant will include a complete replacement of the current production lines allowing the facility to produce advanced vehicles more efficiently and better adapt to changing market needs. Today’s announcement is another economic development win for the state of Mississippi. It brings Toyota’s investment in this facility to more than $1 billion since 2007. Toyota will work with its hiring partner ResourceMFG to hire 400 team members to meet the growing demand for the world’s best-selling vehicle of all time, the Toyota Corolla. Being competitive in the marketplace also requires both a strong workforce and talent pipeline. Toyota will continue “growing their own” by providing enhanced workforce development training at its new visitor and training center. Local architecture firm JBHM designed a 15,000-square-foot facility to support the plant’s growing need to accommodate public visitors and workforce training. Training Center: Workforce development is the fuel that enables Toyota to be successful. The meeting and training space will accommodate up to 120 people and include state-of-the-art audio-visual technology. Public Gallery: The nearly 5,000-square-foot space will feature interactive exhibits, the Toyota Production System and environmental elements while highlighting the success story of the region and the state of Mississippi’s economic development. Scheduled to open in November 2019, the visitor and training center will be open to the public five days per week from 8 a.m. to 5 p.m.